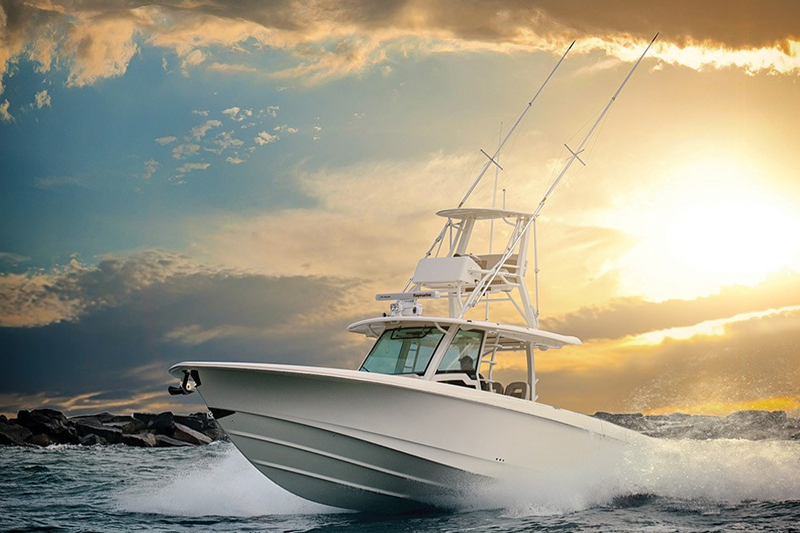 Boston Whaler has been building 30-something fishing boats and 30-something dayboats for years now, and we’ve taken in-depth looks at models from the dual console 320 Vantage to the centre console 380 Outrage, but with this year’s introduction of the 350 Realm Boston Whaler has essentially melded these two distinct boat types into one. 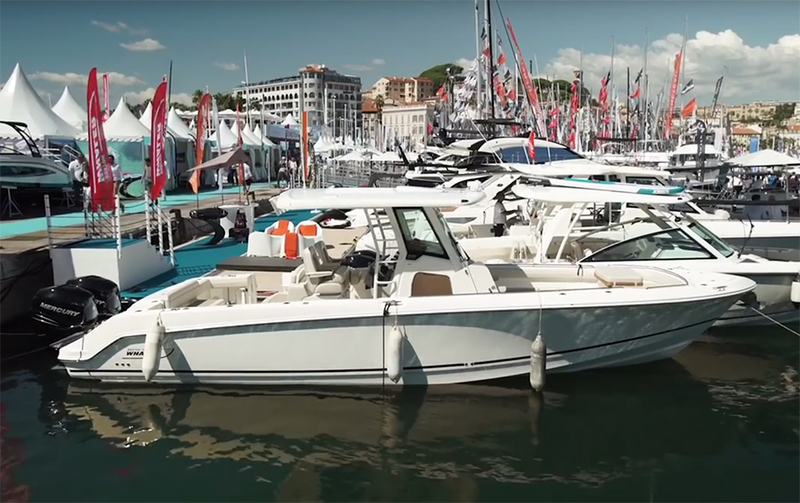 Join us for a brief look at the Realm up-close and personal in the First Look Video we shot at the 2017 Fort Lauderdale International Boat Show, where the Realm made its premier public appearance. First, let’s look at the ways in which the 350 Realm is no different than all those other Whalers we’ve run in the past. 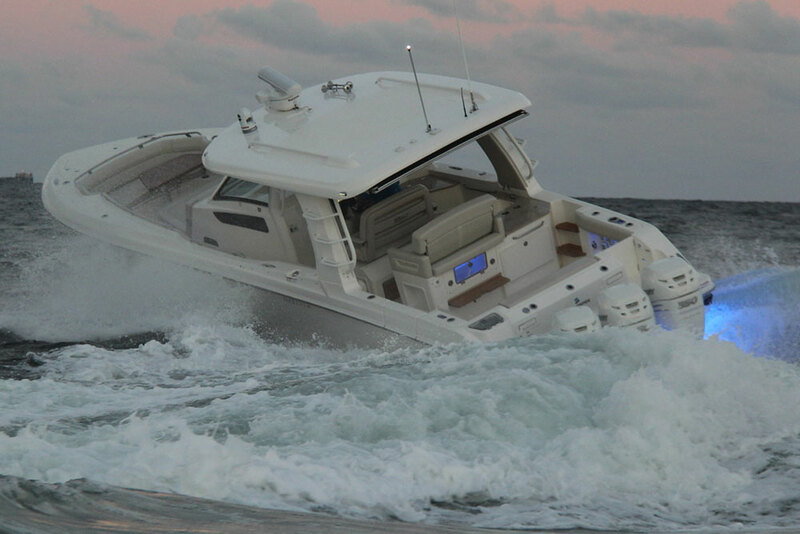 First and foremost, it’s built with the company’s one-of-a-kind glass-foam-glass construction. The hull and deck liner are molded, then get mated in a two-piece mold. Polyurethane foam is pumped into the mold under pressure, filling each and every cavity and air-space between the hull and liner. As the foam solidifies it bonds to every inch of fibreglass, resulting in a single piece that’s incredibly rigid, and yes, unsinkable. 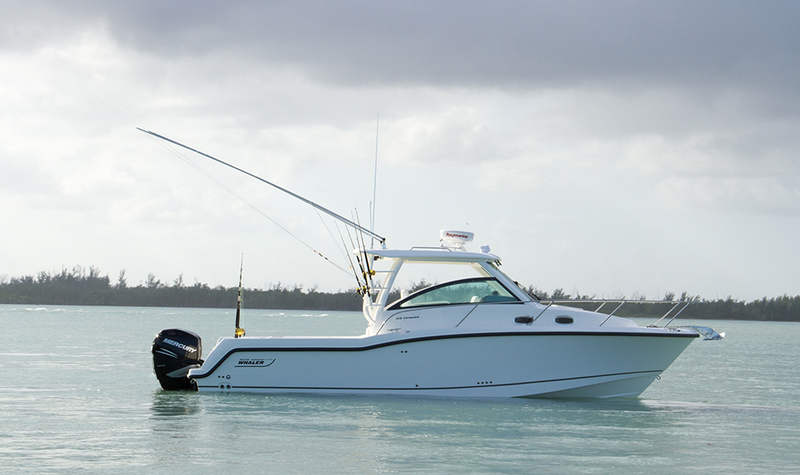 Anyone who’s been on a Boston Whaler can tell you that this construction method results in one heck of a hull, which can hack its way through rough seas without vibrations, creaks, or groans. But if it works so well, why doesn’t every builder use it? Because building boats this way requires heavy-duty molds and heavy-duty engineering, which naturally drives up cost. 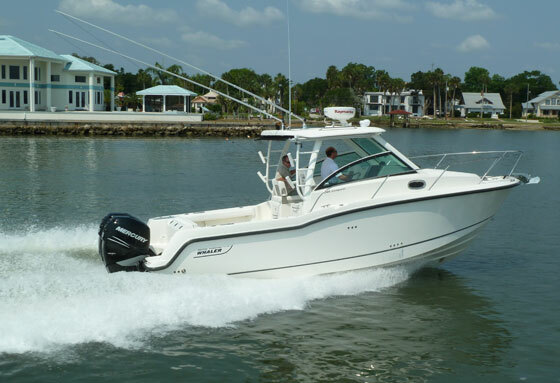 The boat’s bow cockpit is a great place to start, and in truth, this part of the boat also isn’t too huge of a departure from the norm for Boston Whaler. There’s less deck space forward of the console as compared to Whaler’s fishing models and instead, the bulk of this territory is dedicated to relaxing. The front of the console sports a massive lounger, with fold-down cupholder-equipped arm rests. Forward of the lounger there’s a collapsible dinette table, which can be dropped (and a cushion added) to join the lounger with the forward settee and create one massive padded playpen. Also note that the Realm has the same bumped-out forward gunwale around the forward settee that’s found on Whaler’s centre console models, which takes full advantage of the boat’s beam. Wait a moment - did you catch that brief and non-descriptive mention of second-row seating? 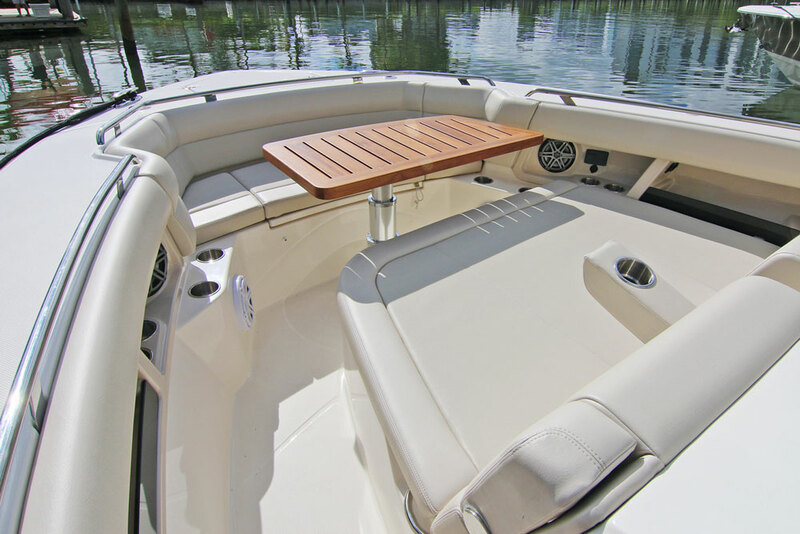 Yup, that’s right, the 350 Realm has a second row aft of the helm station, a feature normally only found on boats in the 40-plus-foot range. Once again this is a tilt towards comfort and away from fishing, since dedicating space to it means cutting back on room in the open cockpit. But for cruises with large numbers of people aboard (the Realm’s rated to carry a whopping 14), those extra seats will be much appreciated. 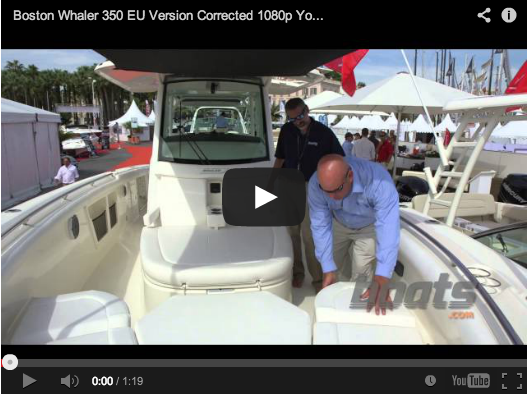 All of the comfort-enhancing features and entertainment options are great, but Whaler fans are going to expect one more thing: stellar performance. They won’t be let down. 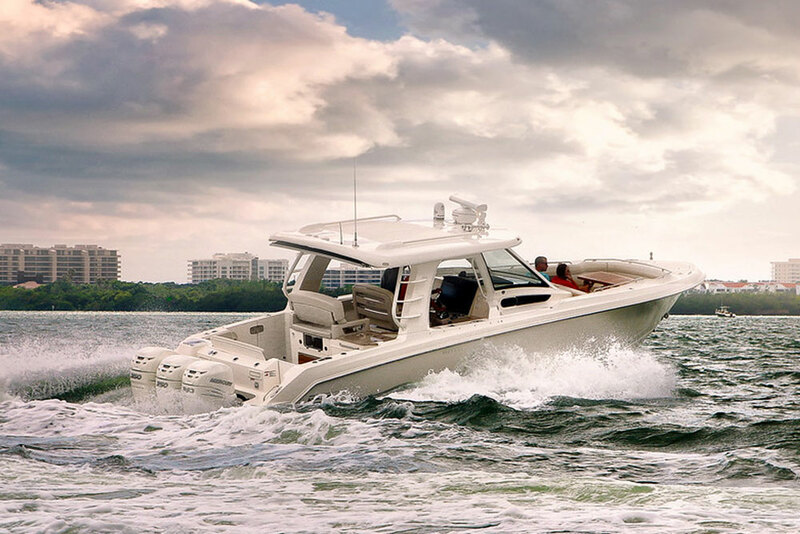 With triple Mercury Verado 350 outboards on the transom, the Realm cruises in the mid-30-MPH range and tops-out at a hat-stripping 52.7 MPH. Efficiency in the cruising range is about 0.9 MPG, and at wide-open, 0.5 MPG. 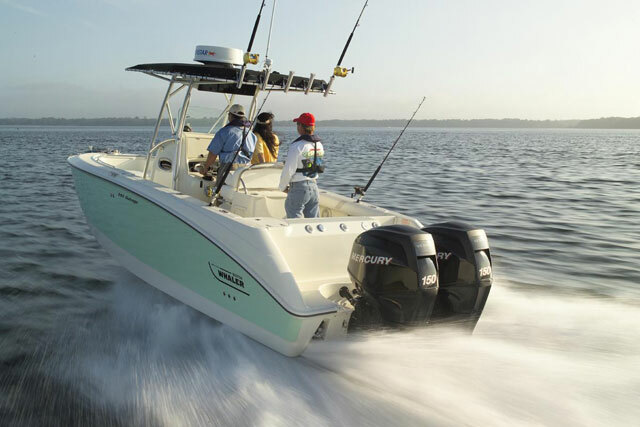 The 350’s are an upgrade over the stock 300’s included as standard equipment, but another option many modern boaters will be interested in is Mercury’s Joystick Piloting. 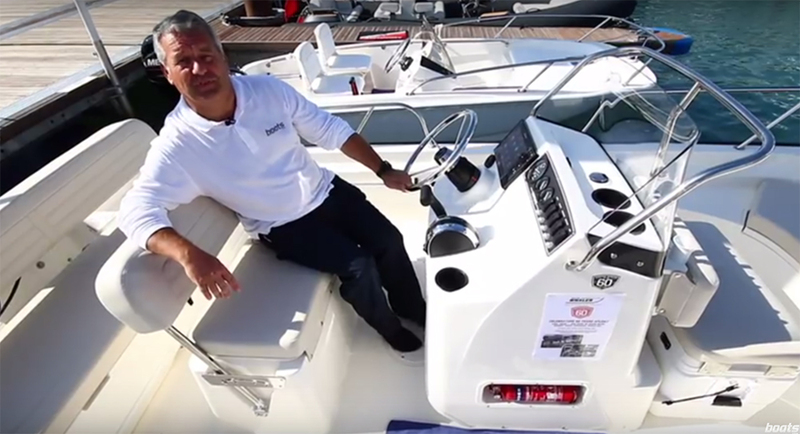 Yes, this adds a significant amount to the boat’s cost, but joystick controls for outboard boats have become incredibly popular in recent years and it’s no wonder why. 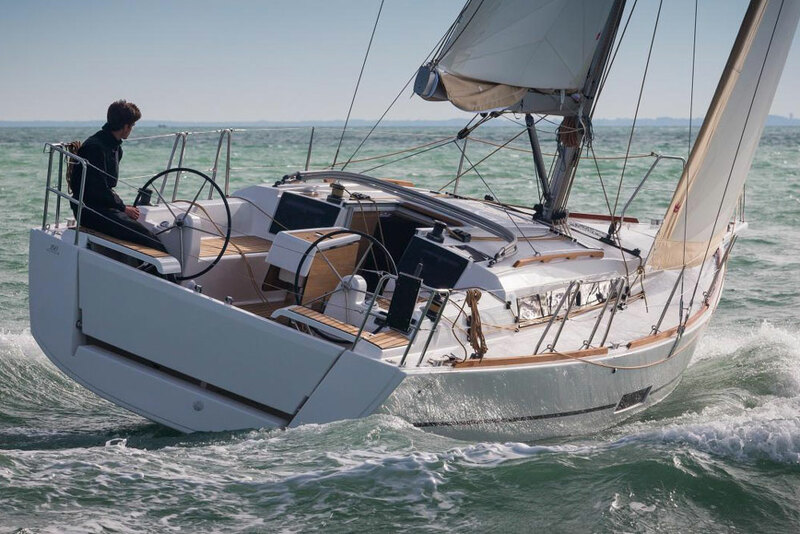 Close-quarters manoeuvreing becomes a breeze, and docking the boat goes from being a chore to a reason for cheers.